The roads were “grand” for Ray’s traveling trailer. Driving on January 19, 1942 through Ohio, he was fascinated by the abundance of farms and rolling hills, red painted barns, individual hog pens, and husked corn left on the ground uncovered, easy pickings for any critters or humans passing by. His love of animals was only equaled by his love of nature – his oil landscapes were legendary in the family. When Ray left the Ohio state line, Kentucky revealed numerous drying tobacco barns and tobacco stalks, and large numbers of stock farms with miles and miles of stone fences. Farther into the state, homes were run down and unpainted. He encountered saw mills from where cut timber was shipped on carts pulled by mules. Ever curious, Ray came upon a large stock sale and stopped to check it out. The soil was red clay interspersed with pine trees. He noticed that filling stations were very far apart. Homes were poorly constructed and never painted. 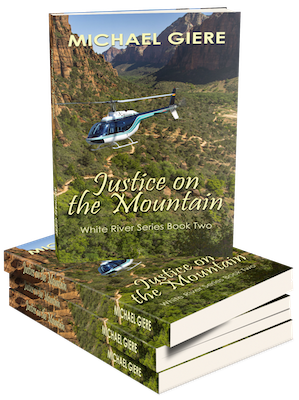 He was shocked to see toilets separate for “colored people.” Going through Look Out Mountain and Rock City, he drove 7 miles to the top on a slow and gradual incline. The shifting foundation had split the large rocks and fashioned rock crevasses 100 ft. or more deep. Large herds of cattle and hogs were wandering all over the highways, no fences anywhere in sight. Large pine forests flanked the highways. Crossing into Georgia, he noticed that the soil was hued red, blue, and yellow. Miles and miles of peach trees filled the landscape. The southern Georgia countryside was packed for miles and miles with pecan trees. Mules seemed to be the beast of burden just like in Tennessee and Kentucky. Georgia homes were built on rock piles or posts with no basements. For the “poorer class,” houses had no windows, only “wooden door flaps.” One dead cow had been hit by a car and the carcass was still in the road. Stopping in the Okefenokee Swamp, Ray walked out into the swamp for about a mile through the quiet and wild surroundings; the silence was only broken by the occasional hammering of a wood pecker and other bird calls. Moss covered trees abundantly and water lilies bloomed gracefully from the swamp; a large percentage of the tall pines were dead, jutting out of the murky black water. At the Florida line, the landscape changed to acres and acres of slash pines on both sides of the road. Pines were slashed to gather resin from which turpentine was made. The slashes were made by removing the bark on an area of 12 by 36 inches through which a metal rod was driven at a 45 degree angle ending into a funnel shaped catch for the resin draining from the tree. Arriving in Jacksonville, Ray remarked that the population was mostly “colored people.” The back of the trailer where they parked for the night was a veritable jungle of palm trees and thick pines covered with Spanish moss. Further down the road he encountered palms, citrus trees, flowers, and a Chinese garden with waterfalls and bridges. On both sides of the highway there were cacti growing everywhere. In St. Augustine, Ray and his family had a drink from the famous well attended by a man dressed in Spanish clothes. “The grave yard of a vanished race of Indians had uncovered graves, showing the skeletons as these burials were made on top of the ground. At one spot, by looking toward the ocean, I could see through a row of palm trees a distance of 3 miles to the open sea; this is believed to be the spot at which Juan Ponce de Leon had landed in 1513 as it was the spot he first sighted upon sailing into the harbor.” A stone monument in his honor is erected to commemorate the location. The next stop was a fascinating fort with its heavy ramparts. Ft. Marion, the Guardian of the Spanish City of St. Augustine, was built from “coquina, shells taken from the beach on Anastasia Island and mixed with lime,” cementing walls ten to twelve ft. thick. Ft. Marion was surrounded by a moat of water 40 ft. wide. The interior court, which crammed 2,500 people inside during a 27-day siege, had a dungeon for prisoners, a Catholic church, and a powder magazine. It was so damp that the powder magazine had a hard time keeping its powder dry. The town was burned to the ground several times by the Spanish, the English, and the French, but the fort never fell. The old wall that surrounded the city is still partially standing. The oldest school and oldest house were also located here. The oldest house had been owned and occupied at one time by Napoleon’s nephew. The beautiful Spanish garden in the back had a wishing well. The old school house boasted eight “pupils” and upstairs quarters for the teacher. A small dungeon served as punishment for students who did not behave properly. Tuition for this school was $12 per year. After the alligator and ostrich farms, Ray visited Marineland, with its fish, coral, other marine fauna and porpoises, and the portholes through which the movie industry had shot most of their underwater films of that time. Ray passed by the famous speedway in Daytona Beach, on his way to comb the fine white sandy beaches for shells. Parking the trailer in Port Orange for a week, three miles south of Daytona Beach on the Halifax River, Ray, his wife, and three-year old blue-eyed Joan enjoyed the Florida sun and the quartz-white beach. Driving through West Palm Beach, Ft. Lauderdale, on to Miami, Ray stopped in Jupiter at Shuey’s Trailer Camp for 75 cents per night, parking about 100 ft. from the government lighthouse. They bought milk for 27 cents with a 5 cent deposit for the glass bottle. Ray and his family spent three weeks in the Tall Pines Trailer Camp. Three miles south of Miami was the Rare Bird Farm with coral flamingos and other unusual birds. Of the 350 species, five species of blue, green, and white peacocks were fascinating. Twenty-two miles south of Miami was the Monkey Jungle, where “humans were caged in chicken wire walkways and the monkeys ran wild into the tangle of jungle-like trees.” For 35 cents admission price, they saw up close and personal chimpanzees, black spider monkeys, marmosets, mangabeys, capuchin monkeys, and other primates. Next was window shopping in beautiful Coral Gables where jewelry stores sold their wares for upwards of $3,800, a rich sum for those times. Coral Gables was confusing to Ray as the streets were all names and no numbers, especially when the names were all in Spanish. For $25 a day and fishing gear provided, Ray broke down and rented a boat to go deep sea fishing and caught his very first sail fish which his wife cooked for supper. Passing by a Seminole village, Ray marveled at the colored patched clothes. An Indian dressed in full Chieftain’s regalia, posed for pictures with visitors for 15 cents each. Parking in the trailer camps in the area was more expensive, $3.25 per week. 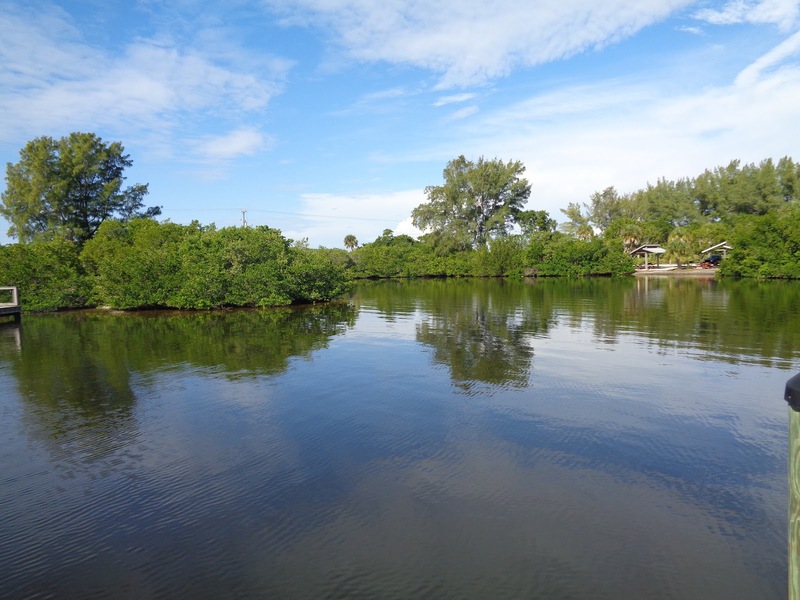 Ray crossed the Everglades, driving on Tamiami Trail, the southernmost 275 miles of U.S. Hwy. 41. The Everglades, thousands of square miles, was a vast tract-less wilderness which could only be negotiated by waterways and the Seminoles were the only persons who could do that at the time. The vast tangle of saw grass was sometimes ten ft. high. One could drive for miles through the big cypress swampland. During the rainy season, even the dry spots become swampland. Of the 16 species of palms in Florida, 13 are found in the Everglades. Forests of bay, live oaks, papayas, and rubber trees grow wild. In between there are large ferns, gorgeous wildflowers, orchids, air plants, and mosses. Large burnt out areas could be seen from the road and, as far as the eyes could see there was nothing but swamp and forest, no sign of human life. Houses were miles and miles apart but close to the road. The abundant wildlife could be seen from the road – turtles on rocks and logs sunning themselves, turkey vultures, American eagles, wood ibis, blue herons, white herons, egrets, almost extinct sandhill cranes, cougars, alligators, native bears, deer, flamingoes, Everglades kite, cape sable, manatees, alligators, snakes, and seaside sparrows. Over 50,000 bird species inhabited the area. 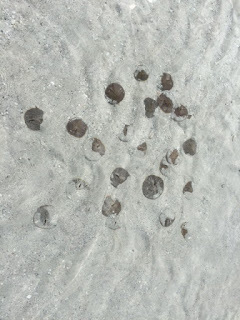 Next stop was beautiful Sanibel Island with its famous sea shell beach. 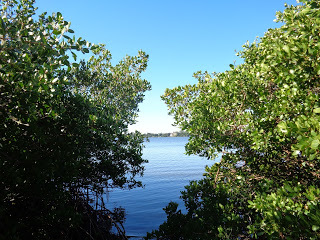 It did not have any camp to park a trailer so Ray drove into Ft. Meyers Beach and stayed there for two days at Don Carlos Trailer and Cottage Court for 75 cents, 300 ft. from the Caloosahatchee River. The wind was blowing fiercely all night, rocking the trailer quite dangerously for comfort.Next morning they drove across the bridge to the Estero Island where the shells were plentiful on the beach – conchs, whelks (a sea snail), sand dollars (a sea urchin), starfishes (marine invertebrates), sea urchins, and scallops. They had to boil the shells as many were still inhabited by marine mollusks. I cannot imagine anyone today on a road trip disturbing nature in this way. But even collecting an empty shell of a dead marine creature is removing an opportunity for another sea invertebrate to find a home inside. Last stop of Ray’s road trip was Sarasota with the largest trailer city in the country. The parking fee was $2.25 per week and the camp had everything to keep one occupied and entertained – free movies, dances with attendance of upwards of 300 people, a five-piece orchestra, first aid room, men’s card room, ladies’ card room, its own newspaper, post office, community hall, grocery store, six horse shoe courts, swings, slides, 14 shuffle boards, bingo, a sand box for kids, and a different program every day. 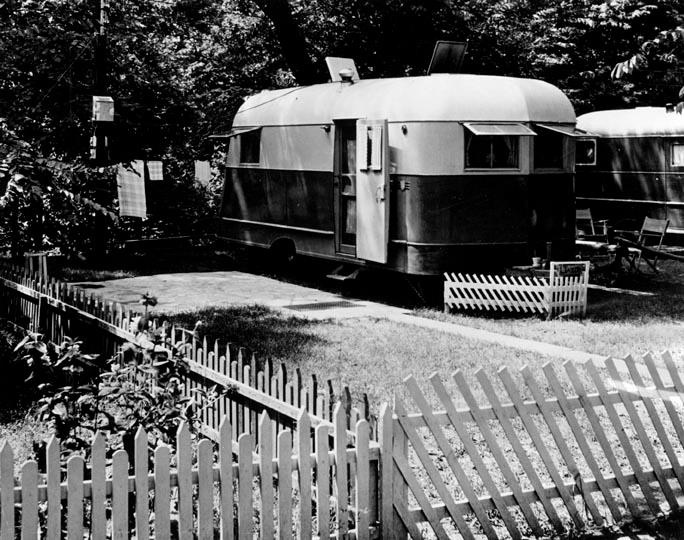 The trailer park had 600 trailers laid out in streets, with beautiful landscaped areas. The only charge levied was a government amusement tax of 5 cents. Sarasota of today, with its Siesta Key, has been voted several times the most beautiful beach in the country. Currently suffering from the worst case of Red Tide in its history, the beach has been less than inviting to tourists for the last three months. Dead fish, brown waters, brown sand, and respiratory distress have dominated reality daily. 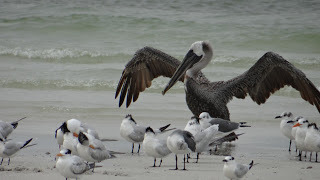 Mother Nature will take its course and will eventually return the sugar white sands and crystal clear waters to Siesta Key.